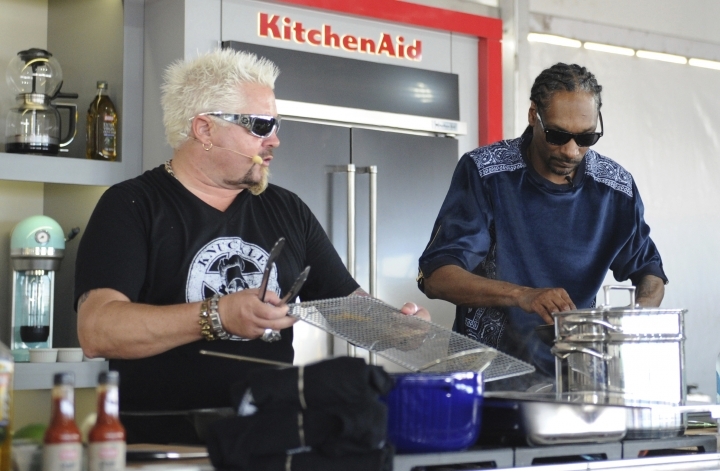 MIAMI BEACH, Fla. — Rapper Snoop Dogg furiously stirred flour into a creamy bechamel sauce, a whisk in one hand and a microphone in the other during a cooking demonstration with chef Guy Fieri. He tossed herbs into the mac and cheese and spicy wing dishes with the dramatic flair of Emeril Lagasse, raising his hands in the air, spinning around after taste tests and occasionally singing lines from songs like "Drop It Like It's Hot" as a crowd cheered wildly. Wearing black shades, his dreads in a ponytail, the pioneering rapper rushed off the cooking stage and emerged 20 minutes later at a nearby beachside DJ booth, also part of the recent South Beach Wine & Food Festival, spinning tunes, including many of his own, while a stagehand passed out joints to the sweaty, enthusiastic crowd. 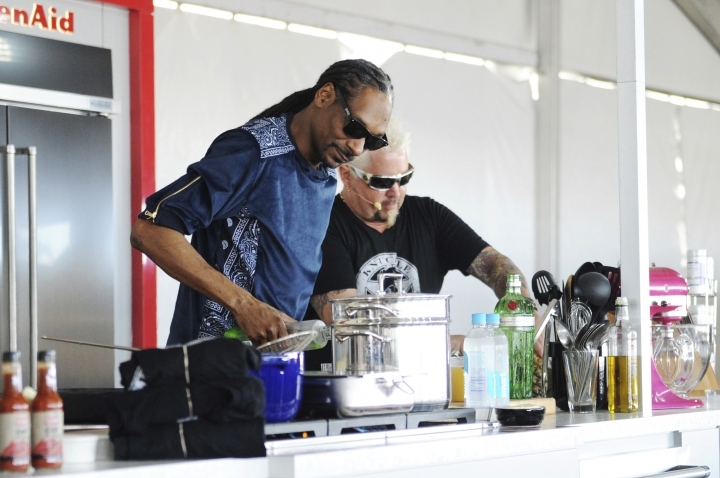 Snoop may seem an unlikely guest for a festival where high-brow foodies come for $500-a-plate dinners to mingle with chefs like Jose Andres and Daniel Boulud, but it's emblematic of the widening intersection between food and music that Snoop and other rappers and hip-hop stars are capitalizing on, where unlikely pairings form shows like VH1's "Martha & Snoop's Potluck Dinner Party" and rappers like 2 Chainz drop cookbooks along with their albums. Mobb Deep rapper Prodigy, who served time in prison, recently came out with the cookbook "commissary kitchen: my infamous prison cookbook," which includes a recipe that mixes Ramen noodles and Doritos. You can even buy Rap Snacks, honey jalapeno potato chips with Fetty Wap's face on the bag. On a recent episode of Snoop and Martha Stewart's VH1 show, she roasted a whole pig, proclaiming the new way to eat pork was "nose to tail." "Nah, nah, nah. In the 'hood we say from the rooter to the tooter," says Snoop, who helped Stewart make a Cuban mojito, busting out a quippy rhyme before toasting the audience. Earlier this month, Miami rapper Rick Ross tapped Stewart to announce the debut of his new album on Twitter. The queen of homemaking also included a photo of her holding a cake with Ross' album cover on top. Rev Run of the rap group Run-DMC has also become a fixture on the food scene with the Cooking Channel's "Rev Run's Sunday Suppers." The father of six told The Associated Press that cooking is more about family time and less about the creative process for him. "Music, like food, has no language barriers. When people hear music or eat tasty food, all of a sudden we have something in common," he said. Marketing experts say Stewart and the Food Network, which sponsors the South Beach festival, are using the partnerships to stay fresh and relevant. "Some of the folks in the food industry are trying to appeal to a younger audience and associate their brands with that," said Darren Seifer, food and beverage industry analyst for the NPD Group. But it's not all about inking new business deals. Some artists were busy in the kitchen long before they started making music. Rapper Flava Flav grew up cooking in his family's soul food diner. Before bursting onto the music scene with the group Public Enemy, he went to cooking school and says he once was the head chef at the Nassau County Courthouse in New York. "It's like music — you're always creating different tastes, different flavors," he said in a phone interview. He's had several restaurants, mostly centered on his fried chicken, that have closed due to "poor management," he said. Rockhouse Las Vegas is currently featuring his grub and he said he hopes to another restaurant. Rapper 2 Chainz, whose hits include "Champions," dropped a cookbook with one of his albums, featuring recipes for beer-steamed snow crab legs and herb-crusted lamb chops. But he's struggled in the food business after the Department of Health recently gave his Atlanta tapas restaurant a dismal inspection. Action Bronson often rhymes in culinary speak. The rapper, whose first album included tracks titled "Jerk Chicken," ''Shiraz" and "Brunch," went to culinary school for a year before dropping out and pursuing music. In an episode of his profanely titled Viceland show, he prepares chicken cutlets with a sesame panko crust that he serves with Mexican chocolate sauce, ice cream, flambeed Hennessey bananas and torched marshmallows, calling it "a fat guy sandwich." R&B singer Kelis, whose music intersected with hip-hop and is perhaps best known for "Milkshake," went to Le Cordon Bleu after hitting the charts, leading to a cookbook, a pop-up restaurant in London and an album titled "Food," with songs like "Jerk Ribs," ''Cobbler" and "Biscuits n' Gravy." "I love working with my hands and getting to create something," said the singer, who is planning to open a restaurant in Los Angeles later this year. "It's very different than music ... you can't really control what you hear. They have to hear it, whereas food is a choice."